The rate for the 4 day/3 night Garden Route tour is R14 500 per person sharing (assuming there are 2 people only). This will be a PRIVATE tour and includes all the standard entrance fees as well as excellent accommodation on a B&B basis. It excludes all your lunches and dinners. Leave Cape Town at 09h00 and drive through the apple orchards of Elgin and Grabouw and on through the rolling wheatfields to Swellendam where we have lunch. On to Mossel Bay where we visit the Post Office Tree and Ship museum. On through Wilderness to the village of Knysna. Overnight in Knysna. 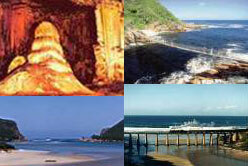 Visit local attractions like Plettenberg Bay, Tsitsikamma National Forest, Storms River Mouth. Outings to EITHER Monkeyland, Birds of Eden OR the Elephant Sanctuary. Overnite in Knysna. Drive to George. Visit the surfers paradise of Victoria Bay. Over the Outeniqua mountains to Oudtshoorn. Visit the Cango Wildlife Ranch and the Cango Caves. Overnight in Oudtshoorn in a tranquil country lodge. Vkisit an ostrich farm at Highgate. On through the arid Little Karoo to Barrydale. Continue along Route 62 to Montagu, Worcester and finally Cape Town, arriving approx. at 17h00.